Carbohydrates or ‘carbs’ are an energy source in food that comes from starch, sugar and cellulose. Carbohydrates provide vitamins, minerals, antioxidants and fiber in the diet. The current recommendations suggest 45 to 65 percent of daily calories come from these types of foods. The 2015-2020 Dietary Guidelines for Americans recommends choosing foods containing complex carbohydrates over refined sources most often for maximum benefits. You can find healthful carbohydrate sources in foods like wheat, corn, rice, oats, barley, quinoa, sorghum, spelt, rye and in fruits, vegetables and legumes. Read on to learn more about the importance of including the right type of carbohydrates in your diet. Complex carbs are foods, which contain vitamins, minerals and antioxidants., according to NIH MedlinePlus. Oatmeal, brown rice, quinoa, potatoes, beans, peas and lentils are examples of complex carbs says the National Institute of Health. Simple carbs are often softer in texture — white bread, white rice and baked goods. Soda, candy and other sweeteners like table sugar and honey are also simple carbs. These easily digested carbohydrates are rapidly absorbed, causing a spike in blood sugar and quick boost in energy. Refined flours have been stripped of some of their natural, high fiber content including the bran, germ or endosperm. Because of this processing, they're digested faster and more easily and deliver fewer amounts of healthful nutrients. Fruits, vegetables and dairy are also technically made of simple carbohydrates but because of the fiber, protein and other nutrients, they act more like complex carbohydrates in the body and should be consumed daily. Carbohydrate digestion begins in your mouth as special enzymes in the saliva start to break complex carbohydrates down. The product that continues passes through the stomach and into the small intestines where more enzymes break carbohydrates down into the simplest form of sugars that the body can use for energy. Though all types of carbohydrates eventually break down into blood glucose, complex carbohydrates take longer to complete this process and offer vital nutrients the body needs along the way, explains Study.com. They also offer indigestible fibers that aren’t broken down and instead aid in gut health and elimination of stool. When simple carbohydrates are consumed, they offer little nutrition and are broken down rapidly causing a sharp spike in blood sugar and the hormones needed to complete carbohydrate digestion. 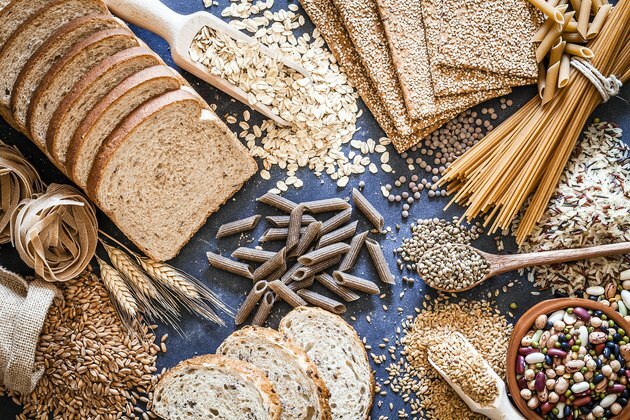 The Whole Grains Council presents evidence from studies of folks who eat whole grain foods that show a lower risk of obesity including a reduced body mass index (BMI) and waist-to-hip measurement. These people also have lower cholesterol level and those who enjoy at least three servings of whole grains each day have been shown to reduce their risk of heart disease by 25 to 36 percent, stroke by 37 percent, Type 2 diabetes by 21 to 27 percent, digestive system cancers by 21 to 43 percent, and hormone-related cancers by 10 to 40 percent. The Linus Pauling Institute sites the dietary fiber content of complex carbohydrates as a contributing factor to decreasing LDL (bad) cholesterol, normalizing blood glucose levels and insulin response over time. Fiber also promotes bowel health by creating a more productive stool to prevent constipation and reduce diverticular disease. When reading a label to learn about carbohydrates, look at three things: grams of total carbohydrate per serving (be sure to identify what a serving size is), grams of fiber per serving and the ingredient list. The total carbohydrate tells how many grams of carbohydrate is in one serving but keep in mind that there can be more than one serving size in the package. Grams of fiber indicate the number of grams of total carbohydrate that won’t be digested into blood glucose. Adult men need 38 grams of fiber per day and adult women need about 25 grams according to USDA Dietary Reference Intakes. A high-fiber food contains at least five grams of fiber per serving. Foods that provide between 2.5 and 4.9 grams per serving are considered good fiber sources. The term “sugar” can be confusing — it has already been counted into the total carbohydrate and indicates either naturally occurring or added sugars. That’s when you read the ingredient list to see if there are any added sugar sources. On the label, look for whole grains within the first or second ingredients, says Diabetes Education Online. Aim for the terms: brown rice, whole-grain sorghum, buckwheat, bulgur, millet, whole-grain barley, oatmeal, quinoa, whole wheat and rolled oats. When the label on a specific food claims that it has been “made with whole grains,” it is important to know what to look for to be sure you are getting a complex carbohydrate source. A better label to look for states "100 percent whole grain." Remember, fruits and vegetables are simple carbohydrates that contain fiber, protein, vitamins and minerals, so they are more complex in nature. These are nutrient-dense foods that should be eaten daily. Position a rack in the center of the oven and heat the oven to 350 degrees Fahrenheit. Line a large rimmed baking sheet with parchment paper. Combine oats, almonds, pistachios, coconut, cinnamon, salt and cardamom in a large boil. Combine maple syrup, oil and extract in a separate bowl then fold into dry mixture. Spread onto the prepared sheet and bake for 15 minutes, stir and then cook 15 minutes more. Granola should be slightly browned but monitor it closely so it doesn't burn. Fold raisins into hot granola and set aside to cool for 10 to 30 minutes, and then transfer to a large bowl. Store leftovers in an airtight container for up to one month. Also freezes well. Livestrong.com: What Is the Meaning of Carbohydrates? Livestrong.com: Why Do We Need Carbohydrates in Our Diet?